A tunnel nearly 600 feet long and 22 feet wide used for smuggling high-powered drugs from Mexico through a former Kentucky Fried Chicken outlet was discovered in San Luis, Arizona. 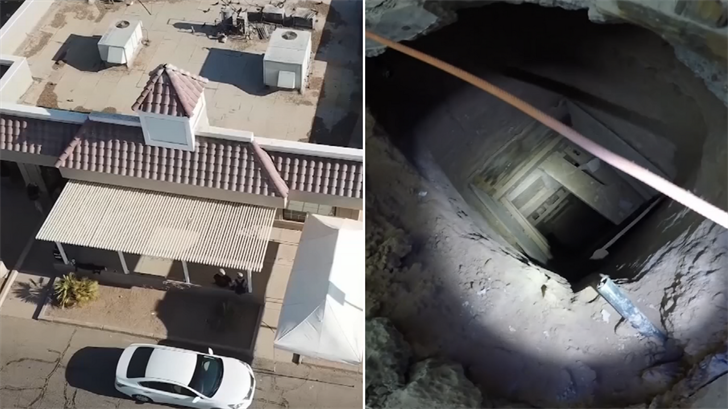 Homeland Security investigators announced on Wednesday that the tunnel was found last week after the San Luis Police Department pulled over Ivan Lopez, the owner of the former KFC outlet. A canine unit alerted officers to two toolboxes in Lopez’s truck, which contained a huge range of drugs. Scott Brown, a Homeland Security Investigations special agent, stated, "[He had] over 118 kilograms of methamphetamine, over six kilograms of cocaine, over three kilograms of fentanyl, over 13 kilograms of white heroin and over six kilograms of brown heroin. Just the three kilograms of fentanyl translates to over 3 million dosage units." Brown said that earlier in the day before Lopez was pulled over, he had removed toolboxes from the old KFC. The tunnel traveled from a home in San Luis Rio Colorado, Sonora, Mexico, to the former KFC outlet. The tunnel opening was a mere eight inches in diameter. According to CBS News, the Mexican side of the tunnel exited through a trap door beneath a bed. After discovering the drugs in Lopez’s truck, law enforcement searched the KFC building. There, they discovered the tunnel. Authorities said the drug smugglers used a rope to pull the drugs up from the tunnel. We must start imposing a stiff punishment on drug dealers. We need to make an example of the cartels. If an American was caught taking drugs across the border of any Country there would be serious consequences. If we didn’t close our eyes to these crimes, criminals may think twice about committing them.